As you might have read in our earlier posts (see Are We Too Big to Eliminate Print Servers?, Eliminating Print Servers in Distributed Offices, and Eliminating Print Servers in Less Than 5 Days), eliminating print servers can benefit your enterprise printing environment in both obvious and unexpected ways—like rapid deployment, vastly simplified multi-site printer management, easy automation and granular auditing. But we realize that the idea of investing in a new enterprise printer management solution can be daunting. How can you justify the migration to a new system when your existing one, however flawed and expensive to maintain, is so deeply embedded in your IT infrastructure? Do the claims about PrinterLogic printer management software's ROI really stand up in real-world implementation? And how long do you have to wait to see this fabled ROI? 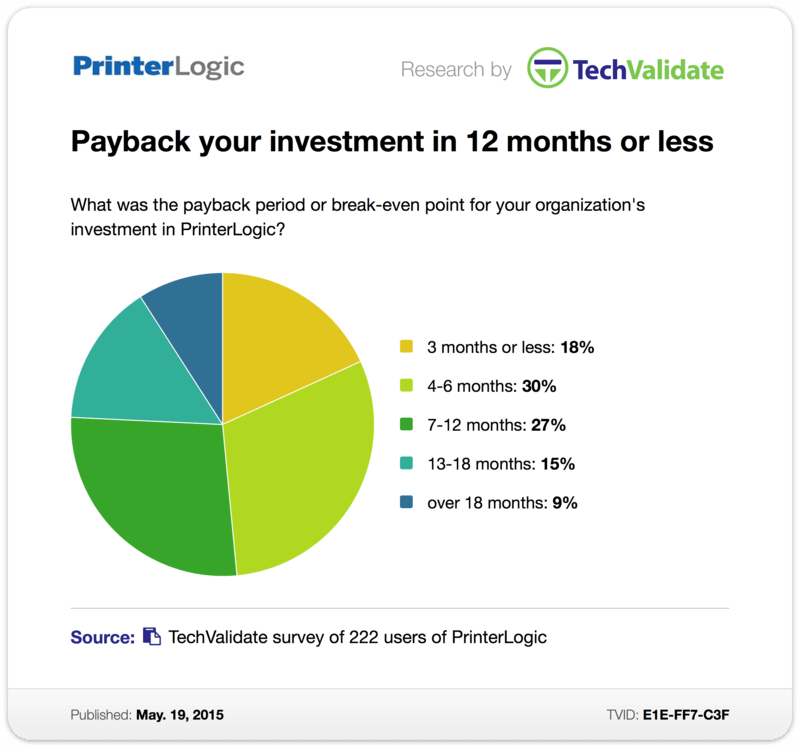 According to a recent TechValidate survey of hundreds of PrinterLogic customers, half saw ROI in less than six months, with almost 20% seeing ROI in less than three months and 75% of these enterprises broke even or saw ROI in less than one year. A mere 9% took 18 months or more to see ROI. What's more, it's not as if you see ROI and then it ends. The efficiencies of PrinterLogic continue to pay off in the long term because those efficiencies are an integral part of the solution. They keep generating cost savings indefinitely. The reduced number of calls to the service desk, the ability to save on consumables, the one-click driver updates, the lack of upfront hardware costs—all those things continue as long as you continue using PrinterLogic as your enterprise printer management solution. One of the biggest contributors to this rapid ROI is the speed with which PrinterLogic can be deployed across an entire organization. And that goes for small organizations as well as large ones. For example, one Fortune 500 insurance company with more than 1,000 printers saw ROI of more than 200% after just six months—and part of that was because they were able to fully install PrinterLogic as their enterprise printer management solution within just ten days. A smaller K-12 school district realized ROI of more than 100% in less than three months. It took them just one day to install PrinterLogic. As for that tiny fraction of companies that took 18 months to see ROI? Well, one of them was a security-conscious federal government agency with more than 5,000 network printers, over 100 sites, and more than 100 print servers. And you can be sure the payback was worth that relatively short wait. They saw ROI of more than 400% after that time, thanks in part to a 50% drop in consumables and a 70% reduction in service desk calls. In the next blog post on this topic, we'll look at a breakdown of the percentage of ROI organizations experienced by eliminating print servers and using PrinterLogic as their enterprise printer management solution.